Traverse the island of Cuba on a comprehensive program, engaging with people from different walks of life for an unforgettable look at a nation once again opening its doors to the U.S.
After breakfast at the hotel, take a tour through Miami’s Little Havana, a neighborhood where many of Cuba’s former residents made their homes after fleeing the island. Pause for a traditional Cuban lunch before transferring to Miami International Airport. Check in at a dedicated A&K counter for your short charter flight to Cuba. Upon arrival at Holguin Frank País International Airport, complete immigration and customs formalities and transfer to your Playa Esmeralda hotel for check-in. This evening, meet fellow guests for dinner in Los Helechos. 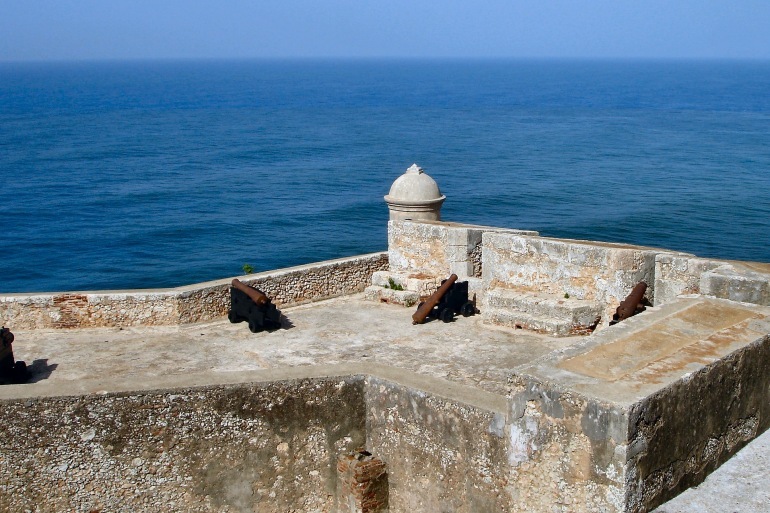 Set out to explore Holguin, the coastal city where Christopher Columbus landed in 1492. Pay a visit to Cuadernos Papiro, a printer making paper from sustainable sources. Here, engage with the employees to learn how its work is still produced on machinery from centuries past. Pause for an authentic lunch at a paladar. Then, attend a magical puppetry performance at Neon Puppet Theater, enhanced by special lighting and fluorescent fabrics. Afterward, meet with its actors and directors for an in-depth look into the art form. After strolling through one of the city’s main squares, visit a local farmer, and sample a cassava specialty, which is prepared while you watch. Return to your hotel, where you dine at leisure this evening. Begin the day in Birán, exploring “Casa Natal de Fidel Castro.” Castro — leader of the Cuban Revolution — and his brother Raúl Castro, the current president, once lived here. Your guide shares significant points in Cuban history and reveals the import of archival pieces from the Castro family vault. Continue to Santiago de Cuba, where you travel by boat to the charming fishing community of Cayo Granma, an island nearly destroyed by Hurricane Sandy. Here, you meet local children and fishermen representing the Dreams and Fantasies Project, which creates art from objects washed ashore to support charitable causes. Sit down to a traditional lunch. En route to your hotel, stop at the Moncada Barracks and hear the details of the first armed action of the Cuban Revolution. Check in to your hotel and enjoy dinner onsite. Begin the day with a stop at San Juan Hill, site of a decisive battle during the Spanish-American War, before continuing to the Cementerio Santa Ifigenia. Here, witness the ceremonial changing of the guard, and see the mausoleum and final resting place of national hero José Martí. Delve further into Cuban history when you visit monumental Antonio Maceo Revolution Square — setting for political and social events — and Céspedes Square, a lively park named for Carlos Manuel de Céspedes, a Cuban planter who freed his slaves and declared Cuban independence in 1868. After lunch at a local paladar, join the owner of a casa particular (bed and breakfast) and participate in discussions about the experience of running a privately owned Cuban business. This evening, dine with fellow participants at a paladar. Visit the University of , where you meet with its students and staff, and discuss the role and structure of education in Cuban society. Proceed to Bayamo for a sandwich lunch at the San Salvador de Bayamo paladar and a leisurely turn around the picturesque main square. Check in to your hotel in Camaguey. Later, ride a bicitaxi (pedicab or rickshaw) through town and into the main square, before enjoying dinner. Start the day at Escuela Vicentina de la Torre, an academy of ballet and fine and performing arts, where you hear about the institution’s creative contributions to Cuban culture. Visit the gallery of leather sculptor, Pepe Gutierrez before stopping to meet one-on-one with expert potters at Casanova Pottery Studio. Learn how the region’s fabled tinajones are made. You also have the opportunity to try a spin at the potter’s wheel. Then, stop to meet with local artist Martha Jimenez, whose sculpture graces the turret atop your hotel. After time to refresh at your hotel, witness an exciting Flamenco performance before dinner at a local paladar. Bid farewell to Camaguey as you make your way to Sancti Spiritus, one of the oldest European settlements in Cuba. Stroll through its historic city center. Then, learn about the island’s iconic, traditional garments at the Guayabera Museum, before walking to 500 Years paladar for lunch. Proceed to Cayo Santa Maria, check in to your hotel and enjoy dinner at leisure. This morning, stop at the Remedios stadium to engage in a shared pastime with Cuban residents: baseball. During the event, meet and talk with the players about sports in Cuban life, with the opportunity to play a few innings together. Later, travel to the Sugar Museum, housed in the historically significant Marcelo Salado Azucarera (Sugar Mill) and participate in a discussion with museum employees on the role the sugar industry played in Cuba’s history. Then, board an old steam train (formerly used to transport sugar cane to the factory), and travel to El Curujey for a traditional, authentic Cuban farm lunch. Return to your hotel and have dinner at leisure. Depart for Cienfuegos, the “Pearl of the South,” named for its stunningly beautiful bay. Set out on an informative city tour through this UNESCO World Heritage Site, with a stop at the Teatro Tomas Terry. Take the opportunity to talk with your local guide about Cuban life, be it about the two currencies used or the cost of living on the island. Stop to hear a performance of classic Cuban melodies by Cantores de Cienfuegos, an award-winning a cappella choir. Afterward, you have the opportunity to speak with these talented young vocalists. Continue to Havana, where you check in to your hotel and enjoy dinner at leisure this evening. Enjoy a panoramic tour of Revolution Square and Havana’s historic and culturally rich neighborhoods. Then, pay a private visit to the Habana Compas Dance studio, where you see a performance. Afterward, meet firsthand with the artists, a chance to learn about the Afro-Cuban rhythms, which meld flamenco and native salsa and rumba movements with percussion instruments. Continue to Finca La Vigia, Ernest Hemingway’s home, and visualize the author’s life during the more than 20 years he lived there. Early this evening, transfer to the Magic Flute for an impressive view of the city. Here, enjoy a private concert of Buena Vista Social Club-style music, sponsored by the Cuban Institute of Music. Then, engage in a post-performance discussion with musicians — a great opportunity to learn the impact music has had on Cuban society and the ways in which it has influenced music in the United States and beyond. This evening, enjoy dinner on your own. Begin the day by attending an interactive discussion about U.S.-Cuba relations with a Cuba policy expert at your hotel. Afterward, stroll through Old Havana with a local architect, discussing the challenges and successes of city reconstruction projects, all the while absorbing the vibrant, extraordinary architecture that surrounds you. Have lunch today at Café del Oriente, poised just off the Plaza San Francisco in Old Havana. Tonight, take a tour along the Malecón in a traditional “Yank tank” (vintage car) en route to your farewell dinner, where you can reminisce about your time in Cuba with fellow guests. Last group event: arrival at Miami International Airport on Day 13.